NATURAL HABITAT AND PREFERRED SITE: American elm is found in all areas of Texas except the high plains in the Trans Pecos. It is also absent form the Rio Grand Plains. It primarily inhabits the eastern half of Texas. American elm adapts fairly well to a wide range of well-drained soils but moist soils such as bottomlands, flats, river and creek bottoms. Also found in deep forests, including those that receive very heavy rainfall. 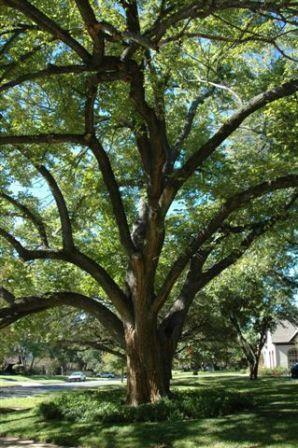 IDENTIFICATION INFORMATION: American elm is a wide growing graceful shade tree with large leaves and yellow fall color. It will usually be wider than tall. FLOWERS AND FRUIT: Flowers are small and green in the early spring. Fruit is a winged nut that ripens after the flowers which generally appear between February and April before the leaves emerge. BARK: Light to dark gray with long flattened ridges and scaly deep fissures on older tree trunks. FOLIAGE: Leaves are simple, alternate and deciduous with yellow fall color. They are large, 4 to 6 inches in length, 2 to 3 inches wide with serrated edges. CULTURE: American elm is relatively easy to grow except for the problem of root fungus. Planted in healthy well-drained soil the tree needs moderate water and low amounts of fertilizer. 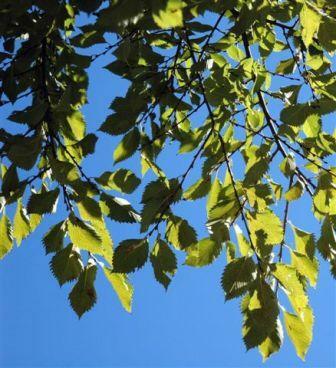 PROBLEMS: American elm is susceptible to Dutch elm disease which can be prevented with the Sick Tree Treatment. Over planting and creating monocultures is the primary cause of this root fungal disease. PROPAGATION: Easily done from seed. Sow the seed immediately after collection. American and most other elms can also be propagated from soft wood cuttings and cuttings taken in late winter just prior to bud break. INSIGHT: I don’t recommend planting this tree but I would save existing specimens and apply the Basic Organic Program and the Sick Tree Treatment if necessary. When healthy, American elm is a graceful tree that some years has fall color that is quite spectacular.